Using the CSIRO Australia Telescope Compact Array, scientists led by Sebastien Muller have made the most precise measurement ever of how the universe has cooled down during its 13.77 billion year history. The researchers studied molecules in clouds of gas in a distant galaxy, so far away that its light has taken half the age of the universe to reach us. To make the measurement they used the CSIRO Australia Telescope Compact Array, an array of six 22-metre radio telescopes in eastern Australia. “When we look at this galaxy with our telescopes, we see it as it was when the universe was younger – and warmer – than it is now”, says Sebastien Muller. The astronomers used a clever new method to measure the temperature of the cosmic microwave background – the very weak remnant of the heat of the Big bang that pervades the entire universe. 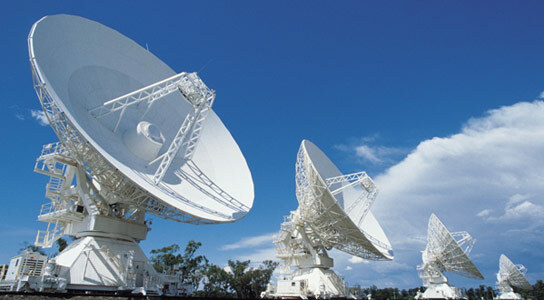 They observed radio waves from molecules in a galaxy so far away that its light has taken 7.2 billion years to reach us. “The gas in this galaxy is so rarefied that the only thing keeping its molecules warm is the cosmic background radiation – what’s left of the Big bang”, says Sebastien Muller. Radio waves (yellow lines) from a bright quasar pass through a galaxy where they are absorbed by molecules in a cold cloud of gas. Astronomers used radio telescopes to measure the temperature of the universe 7.2 billion years ago, by measuring the signatures of the molecules in the radio waves. Taking advantage of a lucky alignment, the team measured light from an even more distant source behind the galaxy, a quasar known as PKS 1830-211. The quasar is a young galaxy which shines brightly because of jets from a supermassive black hole at its center. “We analyzed radio waves from the quasar which had passed through the gas in the galaxy. In the radio waves, we could identify traces of many different molecules”, says Sebastien Muller. Using a sophisticated computer model, the astronomers used these molecular signatures, left like fingerprints in the light from the quasar, to measure the temperature in the gas clouds in the intervening galaxy. The temperature of the cosmic background radiation they measured was 5.08 Kelvin (+/- 0.10 Kelvin). This is extremely cold, but significantly warmer than the temperature which scientists measure in today’s universe, 2.73 Kelvin. Scientists measure temperatures in Kelvin above absolute zero (0 Kelvin = -273 degrees Celsius). One Kelvin is the same size as one degree Celsius. “The temperature of the cosmic background radiation in the past has been measured before, at even larger distances. But this is the most precise measurement yet of the ambient temperature when the universe was younger than it is now”, says Alexandre Beelen, astronomer at the Institute for Space Astrophysics at the University of Paris, France. According to the Big bang theory, the temperature of the cosmic background radiation drops smoothly as the universe expands. “That’s just what we see in our measurements. 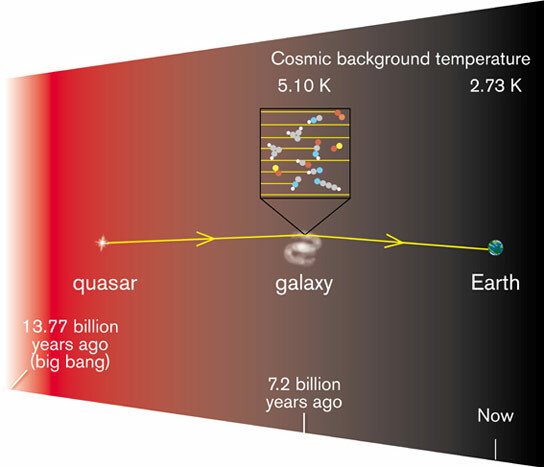 The universe of a few billion years ago was a few degrees warmer than it is now, exactly as the Big bang theory predicts”, concludes Sebastien Muller. In this image, the NASA/ESA Hubble Space Telescope sees the distant quasar PKS 1830-211 as a red point of light among faint stars in our own galaxy, the Milky Way. Astronomers have analysed radio waves from the quasar which passed through a cold gas cloud in a faint spiral galaxy on their 7.2 billion-year journey to Earth. Molecules in the gas cloud are heated only by the cosmic microwave background. The galaxy is just perceptible below the red quasar image. Another, closer, spiral galaxy lies just below this. The image was created using two of the Hubble Space Telescope’s cameras: WFPC2 with filters F555W (green light) and F814W (near-infrared), and NICMOS with filter F160W (infrared). For more information see Courbin et al. 2002, doi:10.1086/341261. Light and radio waves travel at a finite speed, 300 000 kilometers per second. This means that astronomers can study the universe as it was long ago by observing distant objects in the sky. The team observed molecular gas in a galaxy whose distance is such that its light has traveled 7.2 billion years (7.2 thousand million years) to reach us. This corresponds to a so-called redshift of 0.89. The quasar whose light is absorbed by the molecules in the galaxy lies further away, at redshift 2.5 (which means its light has taken 11 billion light years to reach us). 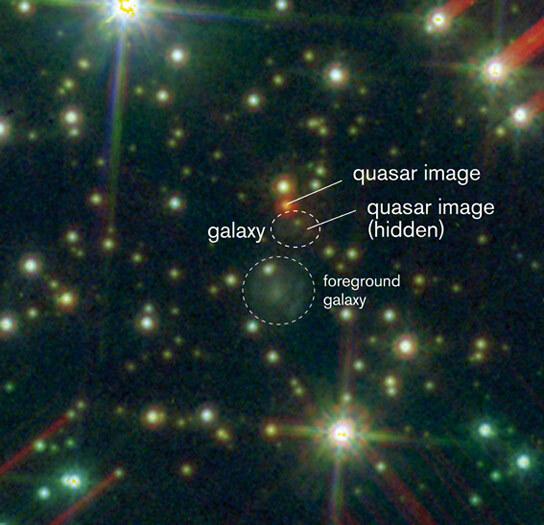 The observations were possible because the galaxy itself magnifies the light from the quasar according to Einstein’s general theory of relativity, that is, the galaxy is a so-called gravitational lens. The cosmic microwave background radiation, a faint glow seen over the whole sky at microwave frequencies by radio telescopes, was discovered in 1957, and has led to two Nobel prizes in Physics 1964 and 2006. The team consists of Sebastien Muller (Onsala Space Observatory at Chalmers University of Technology, Gothenburg, Sweden), A Beelen (Institut d’Astrophysique Spatiale, Université Paris-Sud, Orsay, France), John H. Black (Chalmers University of Technology), Stephen J. Curran (University of Sydney, Australia), Cathy Horellou (Chalmers University of Technology), Susanne Aalto (Chalmers University of Technology), Francoise Combes (Observatoire de Paris, France), Michel Guélin (Institut de Radioastronomie Millimétrique, France) and C. Henkel (Max-Planck-Institut für Rasioastronomie, Bonn, Germany). 2 Comments on "Astronomers Measure the Temperature of the Universe 7.2 Billion Years Ago"
How could the article be printed [on a printer]? I woud like to display in a hard copy format in my School where I teach. Yes, you can print it on a printer.